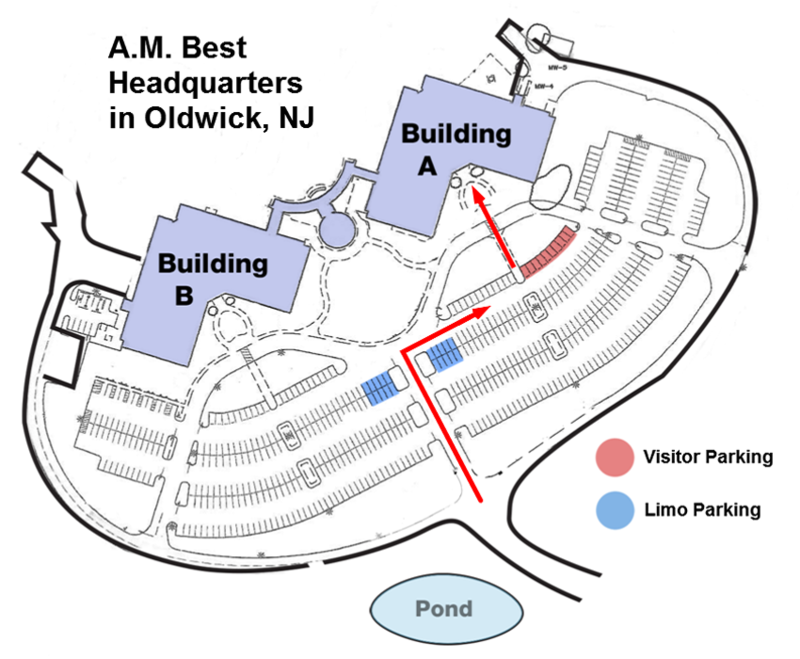 Situated in Oldwick, New Jersey, AM Best's corporate headquarters (view Google map) is conveniently located between New York City and Philadelphia. Download a PDF version of this page and a parking map here. When visiting AM Best, guests are advised to bear right upon entering the parking lot and proceed to the parking spaces marked "Visitors" in front of Building A. Limos can use any of the extra-large spaces designated in front of Buildings A and B. Guests should visit Building A's front desk for a visitor pass, meeting information, and more. 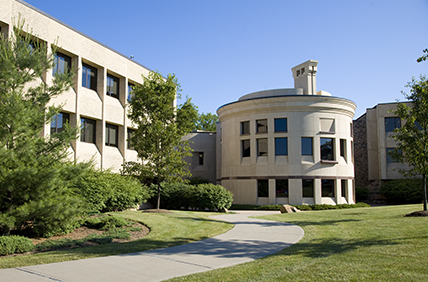 For a complete look at the AM Best campus and parking accommodations, please view this map. From Philadelphia and Southwest (approximately 70 miles): Take I-95 North through Philadelphia. Cross the Scudder Falls Bridge into New Jersey, staying on I-95. Take Exit 4 for Route 31 North and follow it to I-78 East. Follow I-78 to Exit 24. Make a left at the light at the end of the ramp and turn left onto Ambest Road. From New England and the Northeast: Cross the Hudson River on the Tappan Zee Bridge, follow I-87 to I-287 South to I-78 West. Follow I-78 to Exit 24. Bear right off the exit and make an immediate left onto Ambest Road (approximately 100 miles from Stamford, CT). Another route from the Northeast is to take the New England Thruway (I-95) South into uptown Manhattan. Follow directions from Uptown Manhattan. From Uptown Manhattan (approximately 40 miles): Cross the George Washington Bridge to the New Jersey Turnpike South to Exit 14 (not 14A, 14B, or 14C) and I-78 West. An alternative is to take I-80 West to I-287 South and follow it to I-78 West. Follow I-78 to Exit 24. Bear right off the exit and make an immediate left onto Ambest Road. From Midtown Manhattan (approximately 40 miles): Go through the Lincoln Tunnel to the New Jersey Turnpike South to Exit 14 (not 14A, 14B, or 14C) and I-78 West. Follow I-78 to Exit 24. Bear right off the exit and make an immediate left onto Ambest Road. From Lower Manhattan (approximately 40 miles): Go through the Holland Tunnel to the New Jersey Turnpike. Proceed North to Exit 14 (not 14A, 14B, or 14C) and I-78 West. Follow I-78 to Exit 24. Bear right off the exit and make an immediate left onto Ambest Road. From Newark Airport (approximately 30 miles): Exit the airport and follow signs for I-78 West. Take I-78 to Exit 24. Bear right off the exit and make an immediate left onto Ambest Road. From LaGuardia Airport (approximately 45 miles): Exit the airport and head west on the Grand Central Parkway. Cross the Triborough Bridge and take the Major Deegan Expressway (Route I-87) North. Follow the signs to the George Washington Bridge. Follow directions from Uptown Manhattan. From J.F.Kennedy Airport (approximately 55 miles): Exit the airport and follow signs for the Belt Parkway West/Brooklyn. Take Exit 3 to cross the Verrazano Narrows Bridge. Follow the Staten Island Expressway (Route I-287) West and cross the Goethals Bridge. Take Exit 13 to the New Jersey Turnpike North. Take Exit 14 (Not 14A, 14B, or 14C) off the Turnpike toward I-78 West. Follow I-78 to Exit 24. Bear right off the exit and make an immediate left onto Ambest Road. Oldwick is a rural town in which public transportation is not usually readily accessible. Please make arrangements for round-trip travel prior to your arrival. Recommended options are listed below. Newark Liberty International Airport: 37.5 miles from AM Best and about 45 minutes to an hour commute (depending on traffic). La Guardia Airport: 61.3 miles away and about 1 hour and 15 minutes to commute (depending on traffic). John F. Kennedy Airport: 68.8 miles away and about 1 hour and 25 minutes to commute (depending on traffic). Philadelphia International Airport: 72.5 miles away and about 1 hour and 30 minutes to commute. Lehigh Valley International Airport: 37 miles away and about 45 minutes to commute. Personal or Company Aircraft: Two airports and a heliport are accessible to AM Best. Morristown Airport: Within 25 miles, featuring 6,000 and 4,000 foot runways. For details, call (973) 538-3366. Rental car services are available. Somerset Airport: Five miles from AM Best, it is available for smaller aircraft with a 2,730 foot runway. Transportation from the airport to AM Best is not readily available but can be arranged. For details, call (908) 722-2444. Taxi: Unless arriving at one of the airports, advance reservations for departure from our headquarters are required. Uber/Lyft are not readily available. We suggest using PT Taxi (908) 685-8294 or Liberty Corner Limousine (888) 756-5466. Limousine: Please arrange in advance. Our car service providers, MY Limo (973) 887-1122 or AAA Worldwide Transportation (800) 932-7789 will pick up and drop off from any location. Mention AMBest when making your reservation to receive our company discount.